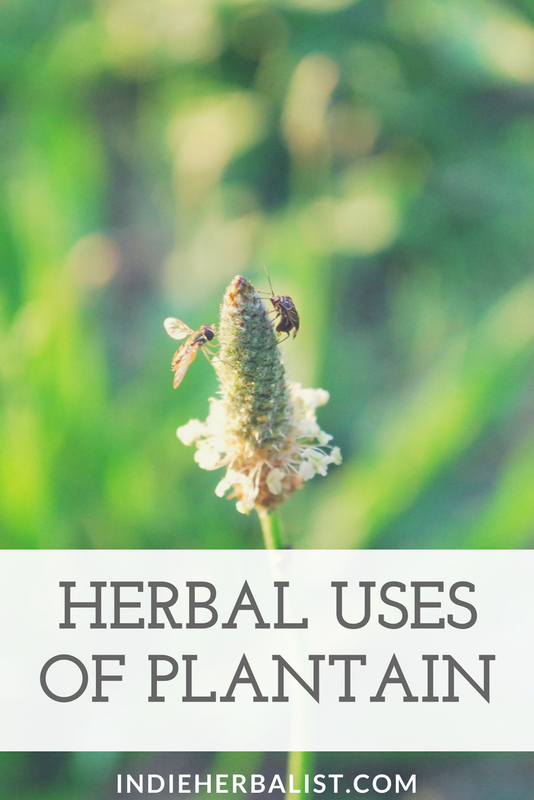 In the southern states, May and June are the perfect months to learn about the herbal uses of plantain because that’s when this herb is abundant and at the peak of its growing season. This is one of the most versatile home herbalists and foraging enthusiasts can learn. 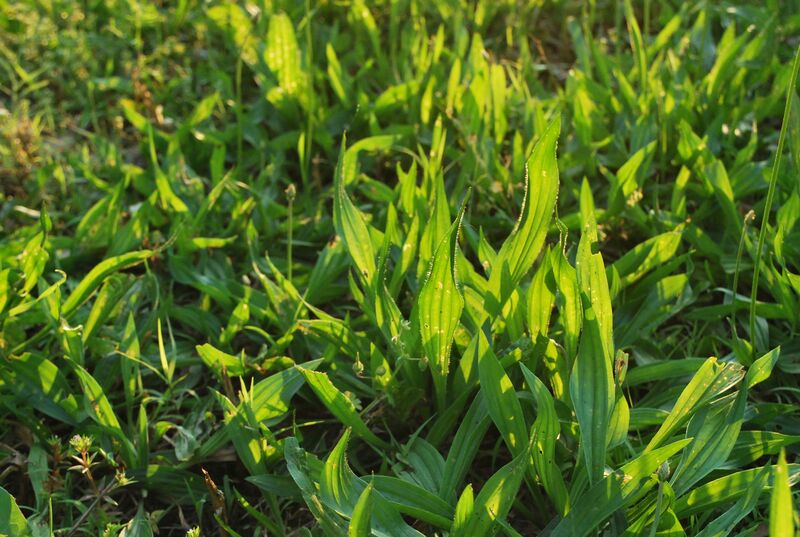 If you go out looking for plantain, look for compacted or recently disturbed soil. 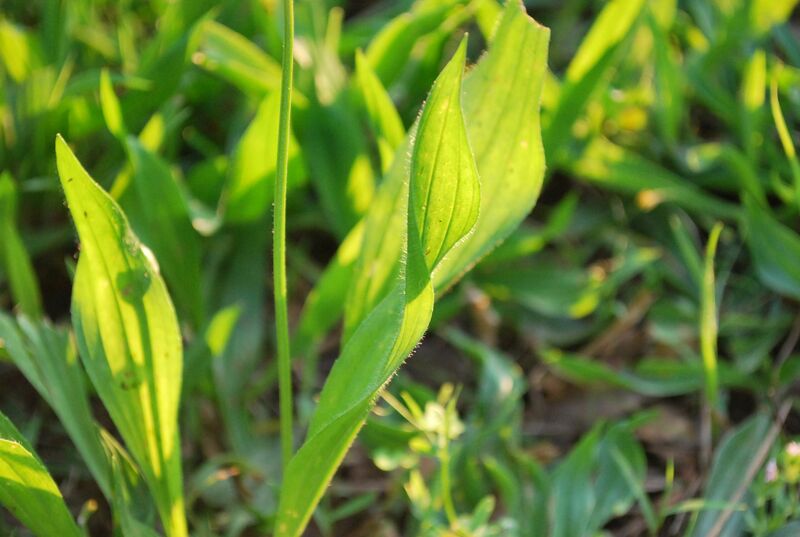 This year I noticed a bumper crop of Plantago lanceolata (narrow leaf, or lance-leaf plantain) in a paddock. This paddock was nothing but rocks and hard earth two years ago, and that’s typical of plantain’s ability to colonize hard ground. Plantain is a weedy invasive native to Europe and it’s actually not very picky about habitat. Around my farm, it grows pretty much everywhere. It is just as at home in dry, compacted soil (like the paddock), as it is in lush, marshy pasture. P. lanceolata is one of two common types of plantain. P. major, the other, is a broad leaf variety. The leaves look more rounded and remind me a little bit of a tongue. I have observed both growing around the farm, but, in my area, narrow leaf starts growing earlier in the year than broadleaf. I’ve also noticed that the broadleaf version seems to prefer lots of water, and will reach an impressive size in shady, wet areas. Plantain is well regarded in old herbal texts, and is used by modern herbalists as well. P. major and P. lanceolata can be used interchangeably. 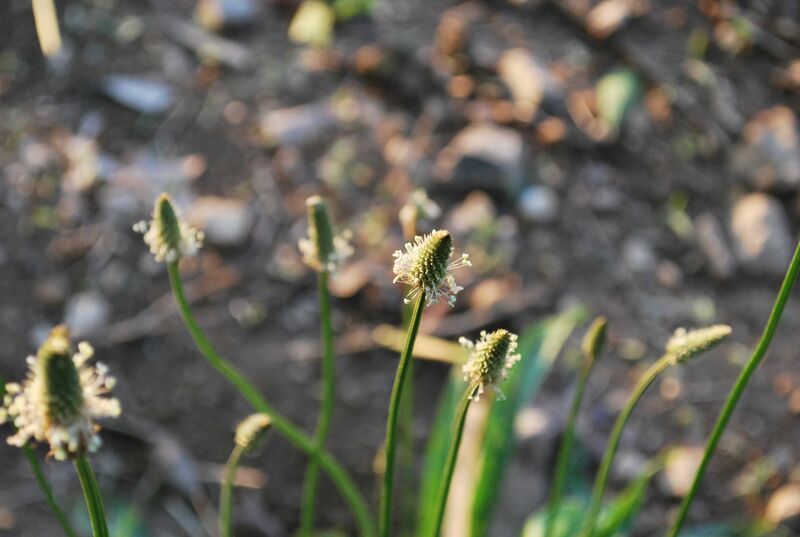 A third kind of plantain, Plantago aristata, is a native plantain that was used by several tribes of Native Americans in much the same ways as P. lanceolata and P. major have been used by Europeans. Native tribes also adopted the use of the European plantains after they naturalized. If you keep a plantain plant or two in your garden, as I do, you can keep harvesting over the summer. Every time you cut it back it will put out a new flush of growth. This can also be a useful way to harvest it in general. Plantain is an annual, meaning the whole plant dies every year and comes back from seed the next. I’ve never needed to buy seeds for plantain. Instead, I just keep an eye out for it while I’m weeding the garden and let them stay once they show up. Historically speaking, plantain was very important for it’s cooling and drawing properties. This is still true in modern herbalism. All of the books that I referenced during my studies agreed that one of the main characteristics of plantain is a cooling action. Saying that plantain is a “cooling herb” is short-hand for observing how an herb acts on the human body. Heat is generally a concept of infection or inflammation; anything that causes “heat signs” like redness, swelling, feeling hot to the touch, yellow colored mucus or discharges, and fever. Plantain is applied in the presence of heat signs and brings balance by cooling. Although everyone agrees about that, there is a little discrepancy surrounding another property of plantain. Is it moistening? Or is it drying? Some sources classify it as moistening while others put it in the drying category- it just depends on who you ask or who you are reading. I think it makes the most sense if you look at it this way. If drying is understood to be a reference to it’s unusual ability to draw out or “dry up” infection or foreign substances, then yes. Technically you could say it is drying. Especially because “dampness” is sometimes used as a traditional way to describe swelling. It could also be that plantain exhibits a tonic action, helping to moisten where the body needs moistening or act as an astringent to dry or tone the tissues where the body needs drying or toning. 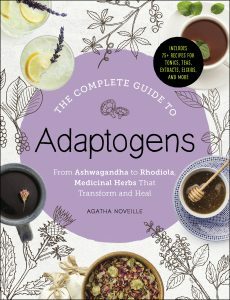 I think it’s interesting to note that, rather than having strong antibacterial properties per se, the plant genuinely seems to cause the body to expel infected material by “drawing out.” This is as opposed to many of the other cooling herbs, where the heat signs more or less gradually subside and dissipate. With plantain, there is often a tidy little plug (it looks like a caterpillar) of infected material that comes out. In my experience, it can be quite dramatic and gross, but plantain’s moistening ability seems to specifically promote quick healing once the infected material is out, often leaving little or no scarring behind. Plantain seems to have an affinity for skin, the intestinal tract, the lungs, and the kidneys. I have seen several mentions of it for use in gout, hepatitis, jaundice, and earache but there wasn’t much detail supplied for those cases so I’m not sure how it was used specifically in those regards. As we’ve mentioned, plantain has an affinity for “drawing” and was used as a drawing agent for pulling out foreign substances and infected material. Think spiders, mosquitoes, snakes, and bees. Obviously, if you get bitten by a snake or spider, the smartest thing to do is get prompt medical attention. Before emergency rooms were around, though, plantain was regarded as a potential help for snake bite. Using the fresh leaves in a poultice was the usual protocol. I know first hand that it works very well for bee and wasp stings. Traditionally used for cough, bronchitis, pneumonia, and asthma. Historically, it seems it’s best suited for cases where the mucus is a by product of a stubborn, nasty infection or there is fluid built up in the lungs. This is because plantain is regarded as cooling and moistening, but also dries up/draws out mucus and water from the lungs. There are several uses of plantain that support oral health. Plantain’s affinity for drawing -out comes in handy once again for pockets of infection or lingering infection after root canal, and other traditional uses include thrush in children, mouth ulcers, and inflamed gums. An infusion can be used as a mouth wash, or an infused oil can be used for oil pulling. It’s especially good as additional help for dirty wounds that are difficult to clean, or for things like cat or dog bites that can get ugly very fast. For broken skin it’s best to use a poultice of fresh or dried plantain rather than a salve. Even with plantain’s reputation as a drawing herb, an oil or wax coating from a salve could set up an anaerobic environment if applied over broken skin and actually promote infection. Plantain is a very gentle regulator for the bowels. It can be a moistening laxative or astringent as needed. It’s best regarded as balancing or normalizing. This is why in old herbals you will find praise for its laxative properties right next to accolades for an ability to dry up dysentery. The soothing, moistening ability can help with inflammation in the intestinal tract. Plantain is seen as a strengthening diuretic, rather than an irritant. Traditionally it was used for edema and low grade inflammation of the kidneys with lower back pain. Herbalists also added it to formulas for bladder infection thanks to its soothing, cooling, and moistening abilities. I have several examples of using plantain as a salve that illustrate this particularly well. A poultice would have likely been just as useful in these cases, and can be a better choice when there is broken skin. In the first instance, I picked up a large splinter under the nail of my ring finger. I pulled it out and cleaned it as best I could, but about a week later the whole tip of my finger started to feel sore. I applied plantain salve under the edge of my nail where the splinter had been, and within about fifteen minutes the area around the nail and the tip of my finger were visibly swollen and throbbing. A friend helped me cut the nail down the middle and pare it back to see if there was a pocket of infection to release. There was, and it came out easily once the nail was pulled back. After that, I packed plantain salve into the nail bed and had no more problems with it. The second instance was a friend of mine who contracted MRSA. The infection developed as sores around the lymph glands under the arms and in the groin. In addition to the antibiotics supplied by their doctor, we juiced cleavers and used them internally for the lymphatic system and applied plantain salve topically. The plantain produced the signature plug of pus every time and gave relief from pain in the infected areas. Eventually the condition cleared and we needed to apply the plantain less and less frequently. They continued the cleavers for a few days after their skin cleared completely, and used it once or twice after that when they felt the infection coming back. Another thing I feel was important in this case, since the underarms were involved, was switching to a chemical free, fragrance free deodorant. The skin was especially sensitive during the infection and removing all potential irritants seemed to help. Plantain is also helpful for my horses. I rescued an older horse a few years ago. When he came to me he was very underweight and had been kept in a muddy pasture. In the process of cleaning him up, we discovered he had some very dirty, ugly-looking saddle sores. Saddle sores can be quite difficult to heal because they typically form over bony areas where the pressure of a poorly fitting saddle rubs the skin away. When there has been neglect or abuse, the problem can be compounded from dirt (or manure, if the horse has been lying down in a stall) keeping the area infected. After applying the salve, however, the old scabs and dirt quickly fell away and had healed up by the end of the week. As an interesting note here, in A Modern Herbal Ms Grieve quotes a Dr Withering, from The Arrangement of Plants. According to Dr. Withering, she notes, sheep, goats and pigs like to eat plantain. However, cows and horses won’t. Well, I can’t speak about whether or not cows eat it, but my horses seem to love it! Especially the lance-leaf variety. This herb is one of our best allies around the homestead. It grows so abundantly and is easy to harvest, and there are so many ways that it has come to the rescue and made our lives more comfortable. It’s amazing what a gift this little plant has been! I look forward to each year’s plantain harvest and knowing that plantain is always close at hand should the need arise. 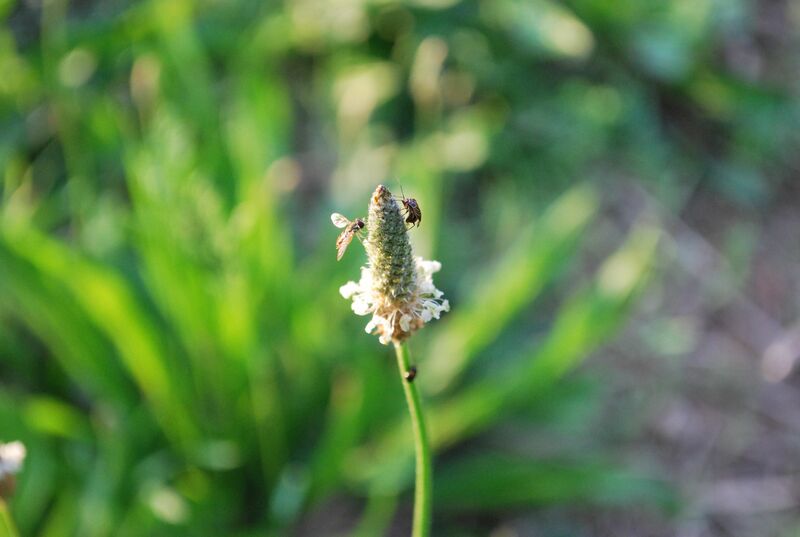 Plantain is definitely a plant that deserves a place in every home herbalist’s plant journal or materia medica. The uses of plantain could fill pages, and learning how to identify and use plantain is a great summer project. If you are interested in learning home herbalism, you might enjoy the post How to Get Started as a Home Herbalist This Summer. Do you have any favorite uses of plantain? Feel free to share in the comments below! I love plantain. In fact, I make sure I have some in or near my garden plot. 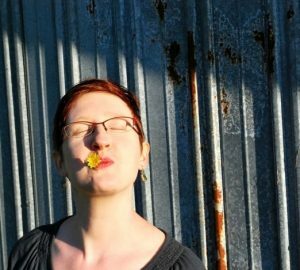 When my grandma was still alive, I’d made a salve of calendula and plantain. I gave her a jar. She had dry skin and the salve worked well for her.